We are open for registration for the 2018-2019 sessions! Here is a list of all our classes to choose from! 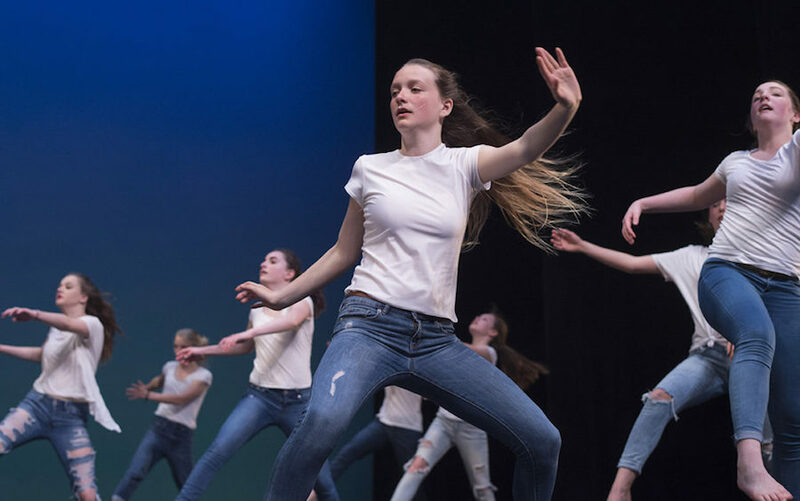 We offer three sessions (Fall, Winter and Spring) for all classes that are not performing in our Spring Show in May (Creative Dance for 4-5 year olds and for all new adult classes). For all other classes which are participating in our annual Spring Spring show we will now offer Winter/Spring combined session as this will allow us more continuity as we gear up for the big show! You can also go straight to our REGISTER page if you are ready to register! To be in relationship with yourself and with your child. To be present in the moment. A space to be together and explore through movement. This class is facilitated by Catrina von Radecki. Full year or Fall, Winter and Spring Sessions available. 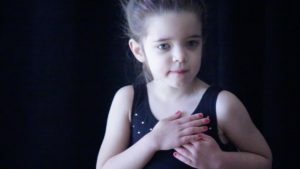 Why Creative Dance for the young child? 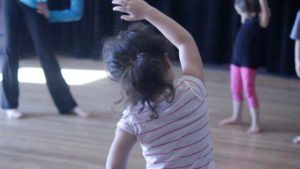 A GYD Creative Dance class is a child-centered practice where children are viewed as active participants who are strong and capable and can contribute based on their own experiences. The child learns to respect themselves and all they are capable of while interacting with others in a respectful and supportive way. This is a place to build strong friendships and where every child is celebrated for their unique way of being in the world. A Creative Dance class is often the first time a child takes a class independent of their parents. This class fosters growing independence by having the child take responsibility for themselves. They come into the class on their own and are asked for ideas and then they are given the space and room to explore these ideas. 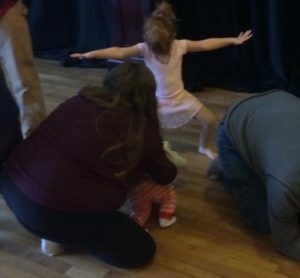 Is this just a free dance class where my child can do whatever they want? Can’t they just do this in their living room? Each class is meticulously planned with a purpose and to integrate past experiences. The class follows a similar structure each week and then provides freedom within the structure to be interpreted and explored in the child’s own way. As the young child learns body awareness, they also learn to develop awareness of dance classroom etiquette and what it means to focus. This will be required in the more technical classes that they may progress to as they get older. Opening Circle– Purpose- coming together as a group and getting to know each other. Practicing listening and responding through a variety of rhythm exercises. Setting up the class to both listen to the teacher while also listening to themselves. Stretching warm-up- Purpose- Stretching various body parts, often using rhyming games to provide imagery, rhythm and fun. Purpose- locomotor exercises to practice listening and following instruction while practising gross motor skills such as walking, running and stopping, skipping, galloping, turning, and developing movement patterns (i.e. walk for 4 and then turn for 4, etc..). After following the teachers instructions, dancers have the opportunity to give their ideas to the group. Water break and then Relaxation- Purpose– connecting deeply to themselves and to their breath, recharging and an opportunity for their bodies to integrate the work that we have done thus far. This helps focus the group so they move more deeply connected to themselves for the following parts of the class. Improvisation-Purpose- exploring movement concepts such as: levels, body parts, space, qualities of movement, speed, dynamics, etc.. This is the time when the child has the biggest opportunity to explore ideas both on their own and with other members of the class. Showings:- Purpose- A chance to be moving in front of others and for sharing ideas and reflecting on what you discovered so we can all learn from each other. Closing Circle-Purpose- a quick coming together as a group to say thank you for sharing with each other before going home! Apprentice I and II Auditions! The Apprentice I and II Company is for serious dancers looking for additional performance and training opportunities. For more information on past Apprentice I company performances please click here. For more information on the Apprentice II company click here. 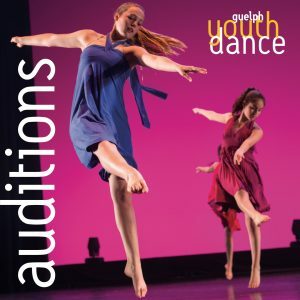 For more information or to register for the audition please contact: catrina@guelphdance.ca or call 519-803-8829. New Spring Fling Contemporary 13 and up Technique this June! This 90 minute class will be taught by Suzette Sherman. Suzette Sherman, longtime associate of master choreographer and teacher David Earle, will teach technique classes in his Graham based dance language. These classes will be taught at an intermediate level and are open to anyone ages 13 up looking to continue their dance training in June or try out the class!